This research has focused on professional development in scientifically based reading instruction using a web-based tutorial model for preparing teachers to improve reading in early grades in the Spanish Language. For designing Letter Program, we carried out previous research where scientific-based materials where tested in the Canary Islands implementing Tier-2 early reading skills for “at risk” kindergarten and first-grade students. We also analyzed teacher’s beliefs and teacher’s knowledge about learning to read. As a result of these previous studies we designed Letter Program including not only tested scientific-based materials but also teacher’s beliefs and teacher’s knowledge assessment. 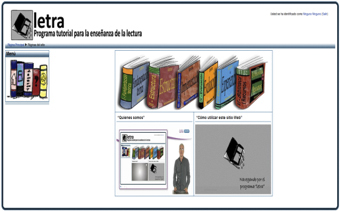 The main purpose of this e-tool called “Letter Program” (www.programaletra.ull.es), is to provide pre-school, elementary teachers and special education teachers with online education, instructional materials and tutorials about how to teach reading, based on the most recent scientific investigations. This e-tool is composed of e-learning modules, self-assessment stopping-points, web-based tutorials for preparing teachers and an interactive discussion forum. The program is based on the Response to Intervention (RtI) model, presenting a preventive character, which is particularly important in educational systems of developing countries. The e-learning modules of the Letter Program provide the teacher with information about the RtI model and the theoretical foundations of early reading skills. The web-based tutorials offer structured materials, based on direct instruction, and these materials are complemented by models of high quality practices in the form of virtual animations and video recordings in the classroom context. Much research suggests that teachers have a hard time implementing techniques that have only been described theoretically, and that positive using video or animation modeling is quite helpful. Furthermore, instructions for the use of learning progress monitoring and assessment are provided. To our knowledge, no technological resources that respond to the need to educate and train teachers in reading education based on RtI model have been developed in the Spanish language domain or, in general, with a developing country orientation. This e-tool has recently been piloted with teachers from different Latin American Countries (e.g., Guatemala, Ecuador, México). The Letter Program has much potential at large scale, considering the future possibilities for every teacher, no matter where in the world, to receive online education about how to teach reading, based on scientific evidence.